SqueezePlay is the desktop version of the Jive / Squeezebox Controller software. 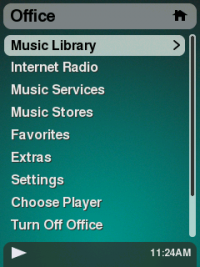 It provides an audio player with roughly the same look and feel as Squeezebox user interfaces, for browsing and playing music and internet streams on your personal computer. SqueezePlay runs on the Mac, Windows and Linux desktop operating systems and can be downloaded from the Nightly Builds. It's a replacement for SoftSqueeze and based on the SqueezeOS software platform. --During text input screens (search, etc), ESC leaves the text input entirely and BACKSPACE acts as a text backspace. ControllerUI the Squeezebox Controller UI. SqueezePlayUI has information on the new user interface for SqueezePlay. Browser, a resolution and color-depth independent renderer that allows us to power a wide range of display types, from monochrome VFDs to full color LCD screens. UI, a new, Lua-based, scalable user interface that can be completely customized by anyone familiar with Lua, a powerful, open-source scripting language. Learn how to make SqueezePlay Macros for automated testing. You can read an overview of the SqueezeOSArchitecture. Patches and suggestions should be posted to the Developers mailing list.